There is magic going on at 345 Smith St in Carroll Gardens. It used to be the space of my favorite Vietnamese in NYC, Nightingale 9. Whether it was the delicate phos or turmeric-gold cha ca catfish, I never had a meal there that was less than stellar. It was one of those places that you could come in for a solo lunch or Friday night date and order half the menu and just feel happy. The corner space is so cute and comfortable, the staff always friendly. Now Nightingale 9 has replaced Seersucker at 329 Smith, and Wilma Jean has moved in. The same feel-good vibe with a Southern menu of fried delights – fried chicken, fried bologna sandwiches and a burger, with plenty of sides. It was love at first bite. The fried chicken sandwich, $7, comes on a soft potato roll, a fat, juicy thigh with an earth-shatteringly crisp flaky coating and buttermilk dressing. The fried chicken dinner is a steal at $14, with three pieces of that crisp-juicy chicken, potato roll, slaw and a side. We chose tater tots as well as fried okra. The okra is perfection, sliced thinly on the diagonal, fried crisp and seasoned. Both the chicken and okra have this more-ish, Old Bay-inspired seasoning that had us licking every crumb off the plate. This is an easy call to make. 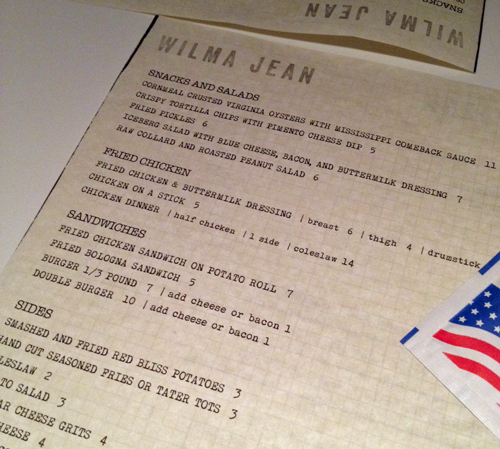 Add Wilma Jean to the top of NYC’s best fried chicken list. Wilma Jean, 345 Smith St, Brooklyn.